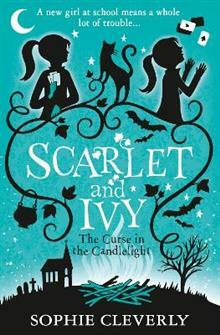 There's a new girl at Rookwood School, and new mystery for Scarlet and Ivy to solve. It's a brand-new term for Scarlet and Ivy, and the girls are intrigued by a fascinating new girl, Ebony. She's as enchanting as she is mysterious, and she's began to gather quite the following - in fact, most of the younger girls appear to be under her spell. But rumours swirl like ghosts around Ebony, and not all of them are nice. And when a prank on All Hallow's Eve goes horribly wrong, it's Ebony who gets the blame. Ivy and Scarlet aren't so sure. There might be more to Ebony than meets the eye, but surely she's not dangerous? But if it's not Ebony, then who or what is to blame? This spooky treat is the fifth book in the SCARLET AND IVY series, perfect for fans of MURDER MOST UNLADYLIKE.